Earth day is quickly approaching and what better way to celebrate than with reusable bags! Since 2014, several states have enacted laws in order to reduce the amount of plastic bags from grocery stores, retail stores and restaurants. These bags end up in our landfills and oceans, contaminating our environment and harming our animals. 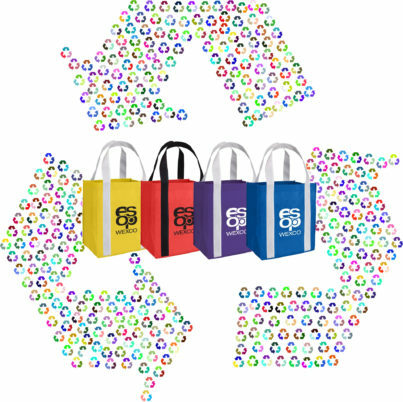 Help the environment, delight your customers and promote your brand with these standout reusable bags from Myron! Go green with this sturdy, reusable and washable bag! Perfect for a trip to the grocery store, your customers can fold it up and easily carry it into the store. Not only is our Grand Tote bag compact, but it is spacious and comes in a variety of colors! Next up is our trendy Enviro Shopper Tote. This collapsible bag comes with a cardboard insert and reinforced handles for added support. Your customers will want to take your branded bag anywhere and everywhere. Made from jute, a natural vegetable fiber, this bag is perfect for the environmentally friendly consumer. If you want to show customers that your business cares about the environment, this is the perfect promotional product for you! Pro-Tip: You can fill your reusable bags with more free goodies to give out at tradeshows or other events! All of our bags are 100% recyclable and made sturdy so they’re built to last. Check out our awesome selection of environmentally friendly bags at myron.com.